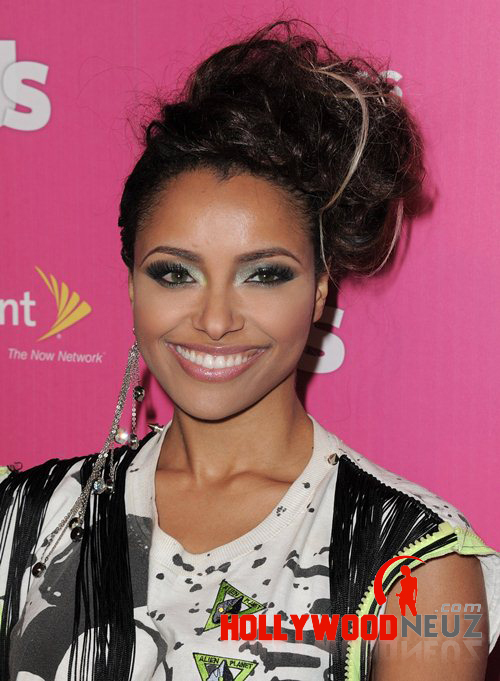 Katerina Alexandre Graham better known as Kat Graham is a famosu Swiss-born American actress, model, singer and dancer. She was born on September 5, 1989 in Geneva, Switzerland. She is the daughter of Natasha Graham and Joseph Graham. She started her career in the entertainment industry when she was at the age of six. At the age of 17 she participated in a national marketing campaign to advertise Coca-Cola’s soft drink Fanta. Since she has started her career she has has appeared in various music videos, including Akon’s “Lonely”, Christina Millian’s “Dip It Low”, Justin Bieber and Usher’s “Somebody to Love (Remix)”, 112’s “What If”, John Legend’s “Used to Love U”, B2K’s “Why I Love You”, Musiq Soulchild’s “B.U.D.D.Y.”, and Nelly’s “Just A Dream” and Diddy – Dirty Money with Usher “Looking for Love”.In 1998 she made her first film debut when she played the role of Jackie in the film The Parent Trap. In 2002 she made her first television debut in the TV series Lizzie McGuire. In 2004 she did a minor role of a dancer in the film Johnson Family Vacation. In 2007 she made her debut in TV movie in the film Hell on Earth. In 2009 she made her appearance in a theatrical film 17 Again in which she played the role of Jamie. In 2011 she played the role of Maria Ramirez in the film Honey 2. Her next debut was in the film Boogie Town in which she played the role of Ingrid. In 2013 she made her appearance in the TV series The Show with Vinny as a special guest.